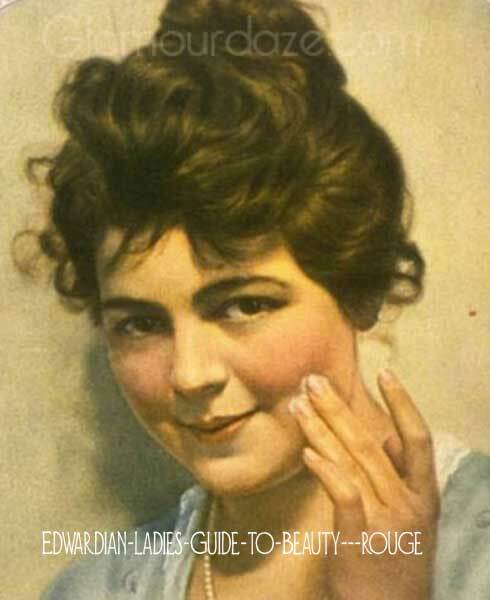 Edwardian Guide to Makeup and Hairstyles. 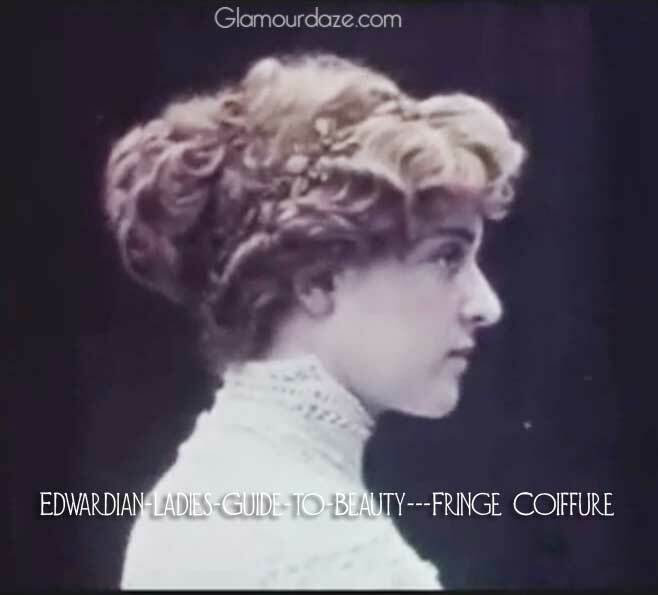 AN EDWARDIAN LADY’S ADVICE ON BEAUTY AND COIFFURE. A beautiful complexion is the most desirable possession, a joy to every eye which sees it, and a suggestion of health as well as of fairness. Its value is so great that in all times women have endeavored to emulate the possession of this charm through the application of powders and washes, producing much the same resemblance to the original thing as an artificial flower does to a real one. 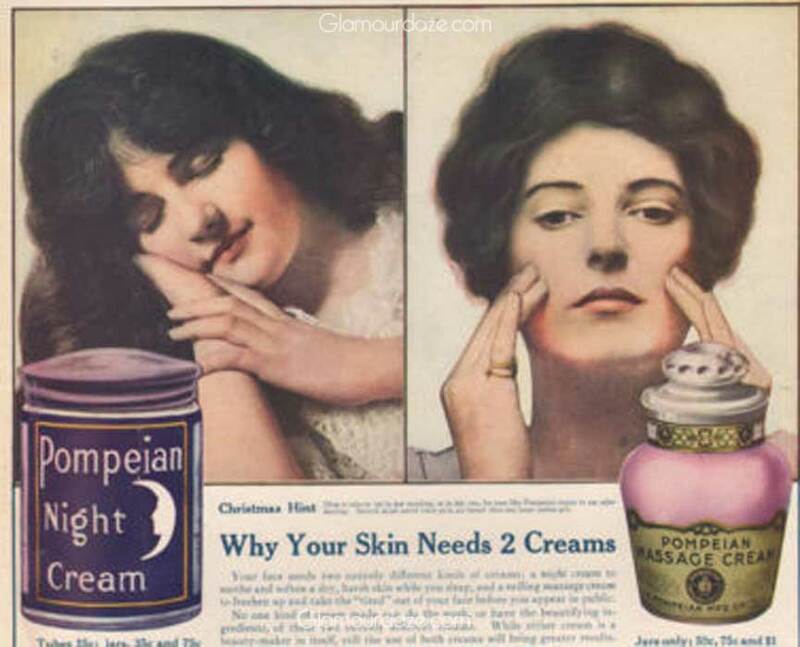 The test of a good complexion is a side-light. A made-up face looks well enough with the light behind it ; but wait till the light falls on it sideways, and you will miss the delicacy of texture which belongs to a natural skin. 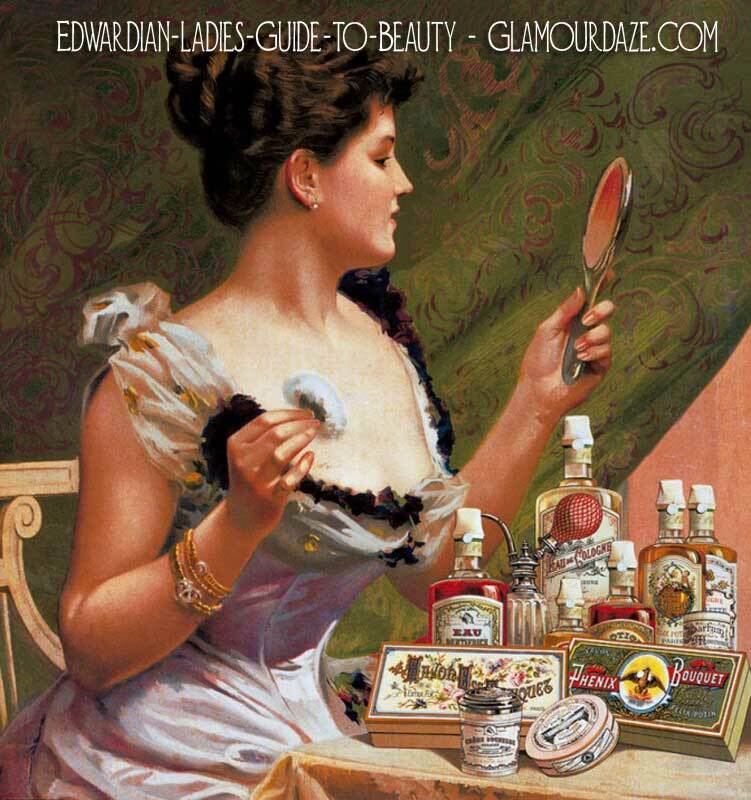 The powder fills up the pores, and presents a flat hard surface where Nature designed somewhat of the same soft and downy texture with which she has endowed the peach. 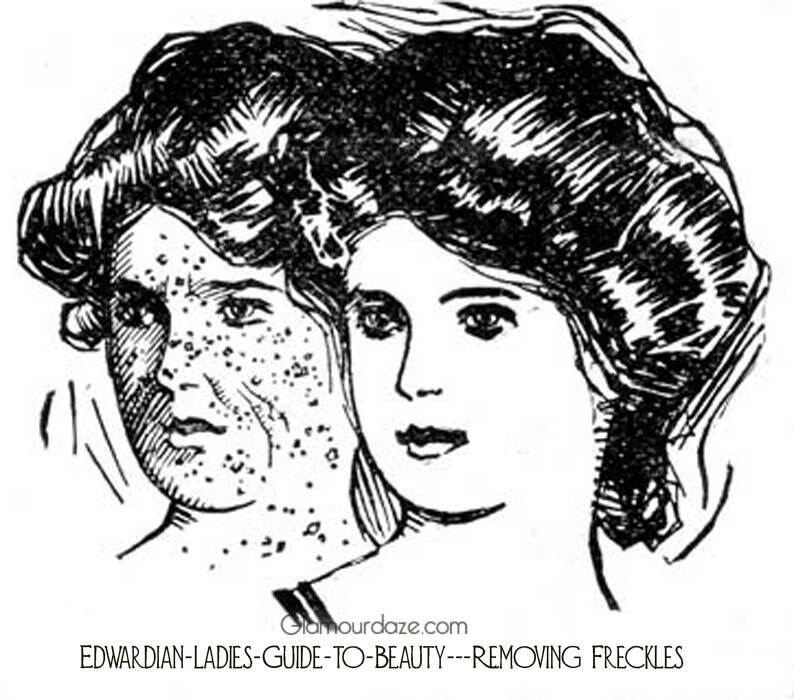 Honey-water is another favourite remedy for the removal of freckles. It is made by mixing some fine honey with about twice its weight of clean dry sand, the mixture being subjected to dry distillation. 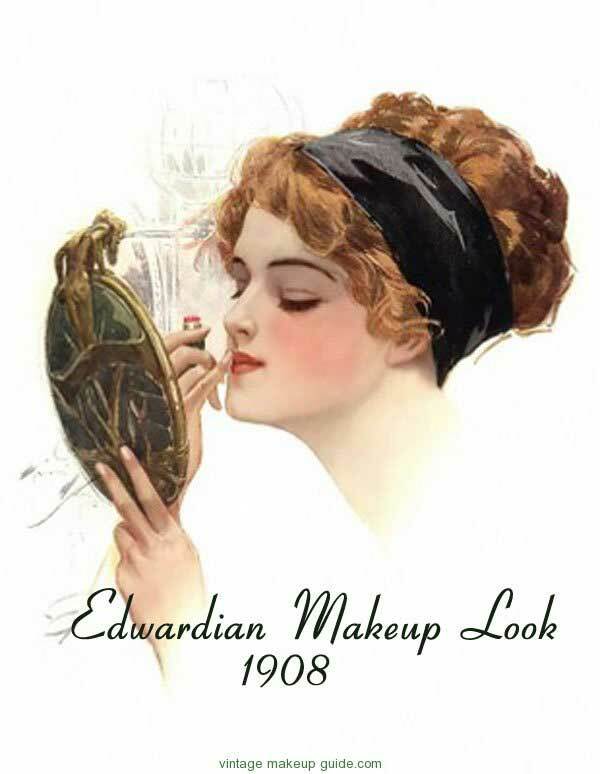 MAKING UP – EDWARDIAN LADIES. Making up the face is a custom which is peculiar to no particular age or country. Dyes and washes are to be found in every country. In Europe, and there is no single nation of which we have any record which has not practiced the cosmetic arts. In this modern age we have many cosmetic face creams and powders to help a lady to be more appealing and per chance – alluring. 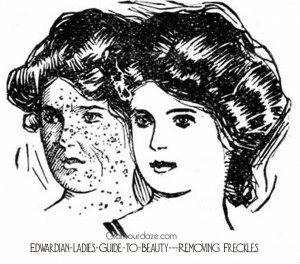 Regular practice both in the evening shade and in the morning dew will keep her skin supple and light! Rouging – an addictive beauty practice! At the present day, nobody owns to rouging, but it is largely practiced in society. The greatest offenders are not, as one might fancy, either the very pretty or the very plain. It is generally the people who just fall short of beauty who fly to this illegitimate means of embellishment — those who fail to grasp the golden apple. They are just sufficiently good-looking to wish to be more so, and they think that a slight touch of colour to the cheek, or on the eyebrows, would make the desired difference in their appearance. They begin with a little dash of colour, and gradually increase the amount, and they get so used to the sight of the rouge, that they forget that every one else is not so oblivious. By-and-by, the face becomes yellow, the pores of the skin grow coarse, and what was begun for choice has to be continued as a necessity. Rouging has been compared to dram-drinking — it is only the first step that costs. The woman who over-rouges feels that she is false, and gradually her voice becomes artificial to correspond. In the days when painting was universal, it is possible that it did not exercise this effect upon the character ; but that it has that effect at present no one who studies character can doubt. 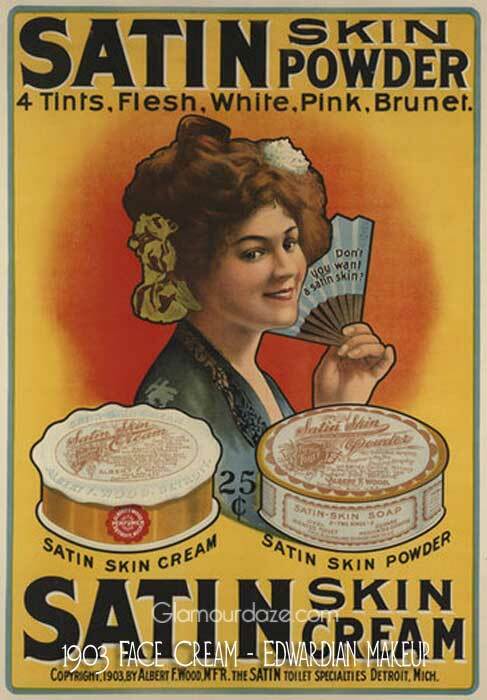 Carmine is the most dangerous of all the colouring matters used for the face, because it is of a mineral nature. However no other colour approaches it for brilliancy and its starling beauty effect upon the skin. But be careful in its over-use. Rouge is comparatively harmless, because it is a vegetable substance. It is made of safflower — the flowers of a plant known to botanists as dyer’s saffron, which grows in Spain, Egypt, and the Levant. 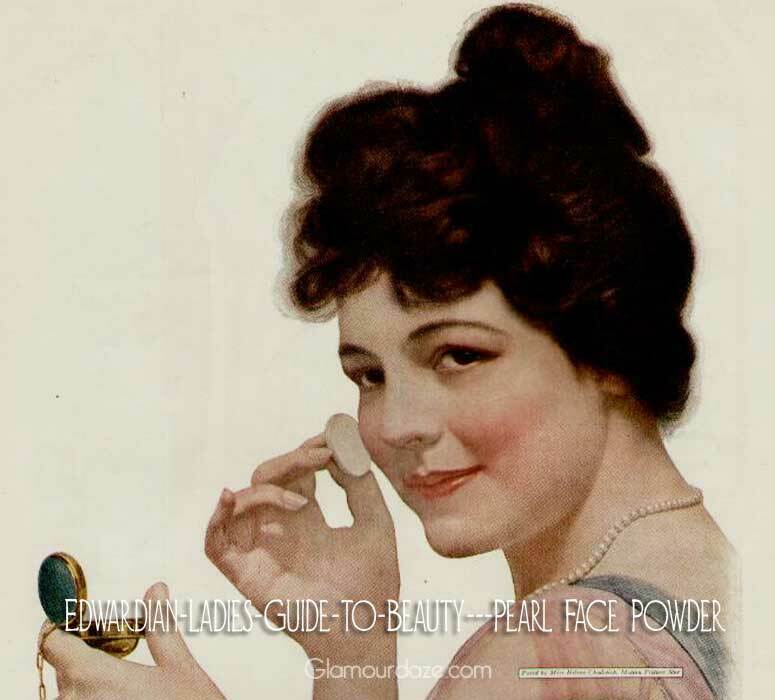 Pearl White – the Edwardian Makeup favourite. Pearl-White is a common favourite for today’s discerning lady. It achieves a remarkable skin whitening and smoothness which restores a youthful feminine flush to a girl. However – beware of it’s over-use as it is made of bismuth and can harm the skin. [ Ed: this is now known not to be true – bismuth is quite low in toxicity! ] if you apply Pearl White too often it will render your skin yellow and leather-like, and according to some reports induce paralysis if long continued. [ Ed – also not true! ]. Powdered starch or oatmeal are the safest for the face, and good violet-powder may be added to the list. But to use any powder continuously is harmful to the skin, preventing perspiration, clogging up the pores, and making the complexion dull and rough. In fact, when we recall all the ills which painted flesh is heir to, we feel inclined to give to those who are intending to make up Mr. Punch’s celebrated advice to those about to marry — Don’t. 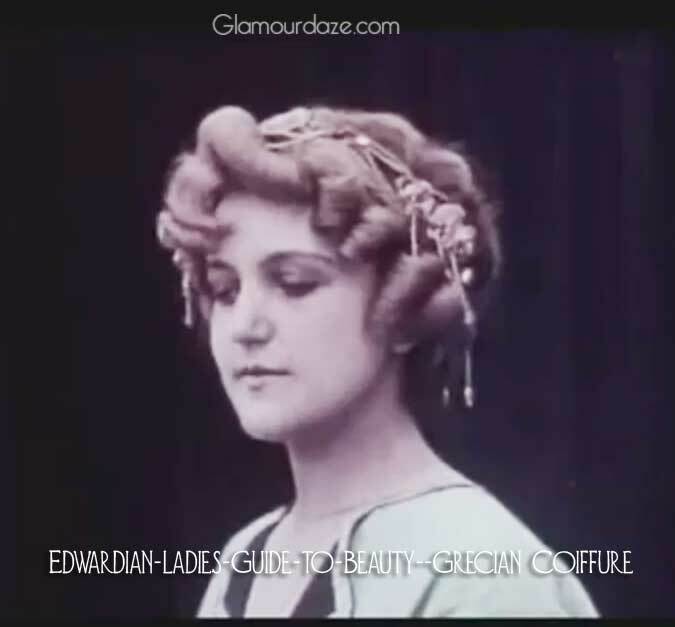 THE COIFFURE – EDWARDIAN LADIES HAIRSTYLE TIPS. The size of the head and the shape of the face have both their effect in influencing the style of the coiffure, but it is ultimately decided by the shape of the nose. The woman who owns a nez retrousse [ snub nose ] has her path in life mapped out for her. She must never be serious nor solemn, dignity of deportment will only make her ridiculous. For her there will be no smooth bands nor stately draperies, but gay, coquettish frocks, and floating ends of ribbon. A certain amount of disorder will be rather becoming than otherwise, and the severe and classical style will be always out of the question. 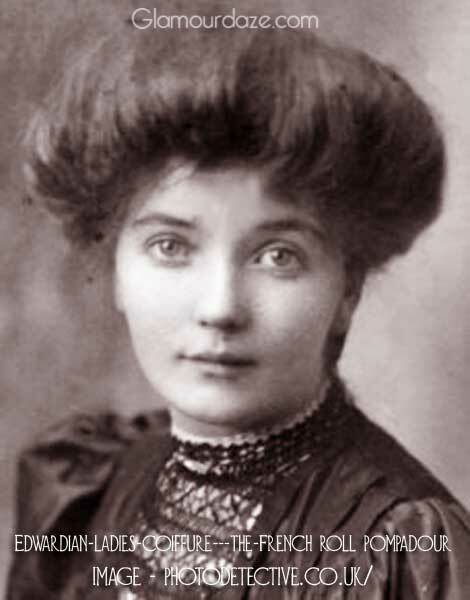 Soft frizzy curls are suitable to the tip-tilted nose, but smooth bands and meekly parted hair would fail to carry out the prevailing idea of the face. The woman with the Grecian nose may wear her hair in a classic Grecian style, curls over the forehead, fillets across the head, and the hair combed up to the top of the head, or rolled round at the nape of the neck. An aquiline nose demands a careful coiffure ; the hair must not be strained too tightly back, so as to place the nose too much in relief, nor must it be too flat on the top of the head. A large nose needs a high coiffure, and it is better not to cover up too much of the forehead. The fringe over the forehead suits nearly all faces, but particularly those where the brow recedes. The hair a I’lmperatrice [ Empress ] suits very few, needing a well-shaped forehead and perfect eye-brows. Lightness is gained by dressing the hair high on the top of the head ; softness by placing it low on the nape of the neck. 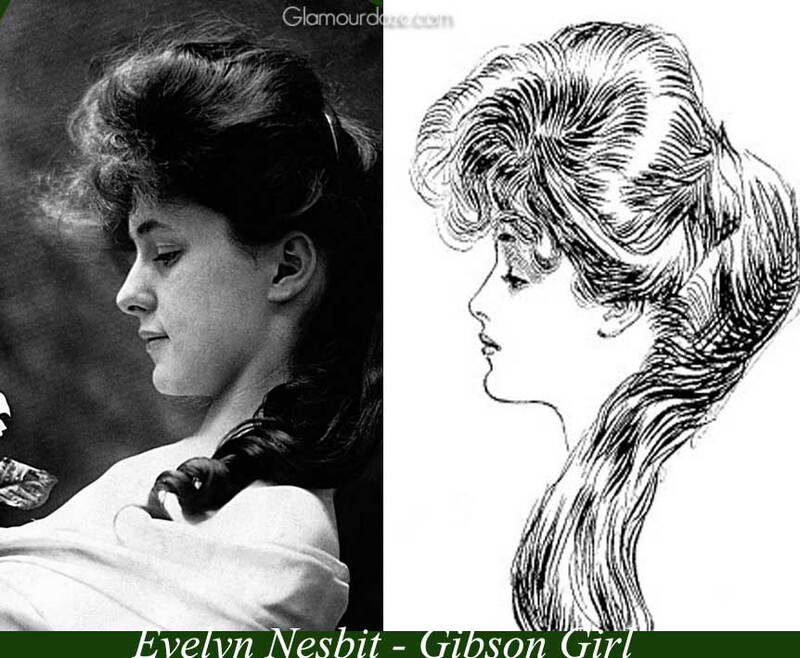 The low pompadour hairstyle – which has received a new lease of life thanks to the Gibson Girl illustrations, generally requires a youthful expression and small nose. The Low Pompadour – a crescent shaped padding goes from ear to ear over the top of the wearers head. The hair is taken from the forehead hairline straight over the pad to the back where it is retained by various methods such as the bun, coils or a simple tie. A woman must choose whichever style suits her best ; and she alone knows whether she wishes to cultivate the gay and sprightly in appearance or the gentle and demure. 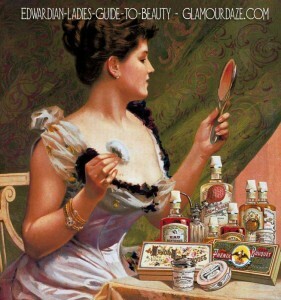 I have just read you interesting article about make-up in 1905. It would be of value to your readers to know the sources from which your article is derived. For example, book titles or a magazine issues?